The Good Girls left the driving to Jet Blue and Uber for their quick trip to New York City in January. It was all travel business until the last day when we spent the morning at the 9/11 Memorials and Museum. It was too strong an experience not to share. Judy's comments are in italics, Debi's in regular type. The paper and the people, that’s what I remember most from the day I visited this site two months after 9/11. Wisps of paper, sheets of paper caught by bare tree limbs or swirling about on new wind currents filling the empty space of the twin towers. Computer paper, letterhead, memos. Ten million square feet of office space holds a lot of paper. Paper signs and banners posted on every surface: Have you seen? with a photo, name and a number to call; Do you know? Same information. 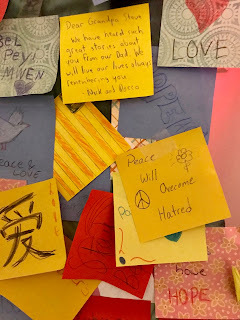 Banners with child-drawn pictures with words like “We love you, Be strong, We are with you.” Professionally prepared banners with similar sentiments. Paper littered the graveyard behind St. Paul’s Chapel, both remarkably intact. People were everywhere, milling around, reading the banners but avoiding the paper signs because they had no information. 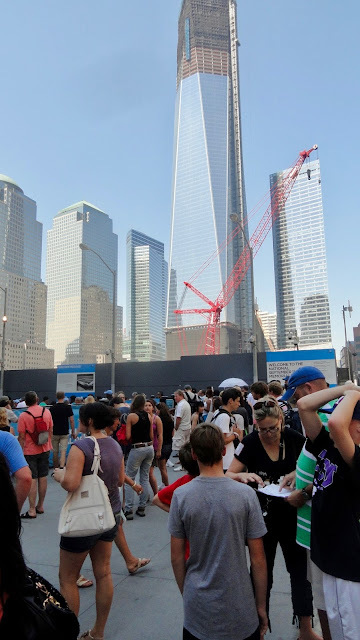 Many queued for a turn on the observation deck where they could watch responders laboriously picking through rubble down below. The air at ground level was gritty, scratching against my contact lenses and it was hard to imagine what it was like down at Ground Zero. Security men and women tried vainly to keep the quiet crowd out of the way of traffic and responders trudging to the chapel for a moment of rest or a bite to eat. Those men will always be with me, their thousand-mile stares, visible exhaustion, ineffable sadness and dogged determination to do the job. You must prepare yourself mentally and emotionally for a visit to the September 11 Museum in New York City. 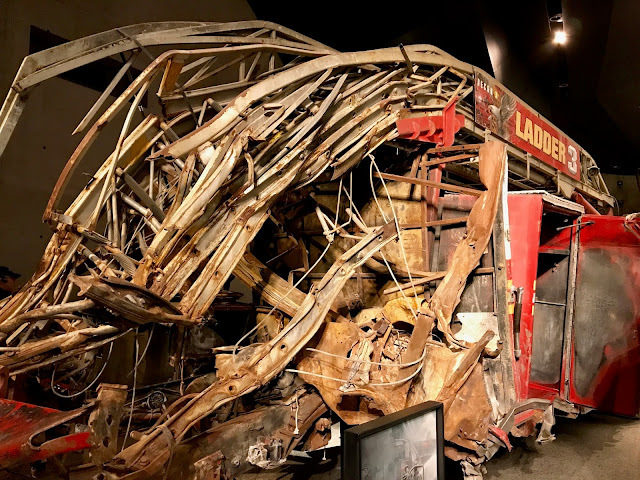 The horrific events of that day will be revisited, but this museum tells many stories about individuals who helped save lives as well as the stories of those near 3,000 who died. 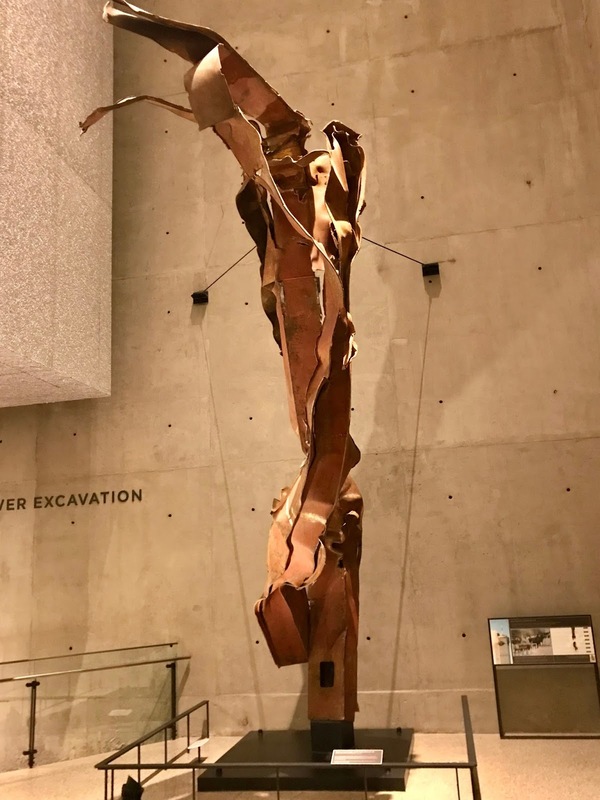 The National September 11 Memorials and Museum were built to remember and honor those killed in the terror attacks at the World Trade Center site, near Shanksville, Pa., and at the Pentagon, as well as the six people killed in the World Trade Center bombing in February 1993. As you approach, you come to the Memorial’s twin reflecting pools called Reflecting Absence. Each is nearly an acre in size and features the largest man-made waterfalls in North America. The pools sit within the footprints where the Twin Towers once stood. You see cascading water drop from street level and vanish down holes in the center. You can’t see the bottom. The symbolic absence of what were once the tallest buildings in New York becomes impactful. The name of every person who died is inscribed around the edging. In 2012 I returned, this time to see the just finished Memorial pools and the temporary exhibits. Mobs of surprisingly quiet people stood on line underneath scaffolding. Honoring the names. Photo © by Judy Wells. Survivor Tree. Photo © by Judy Wells. 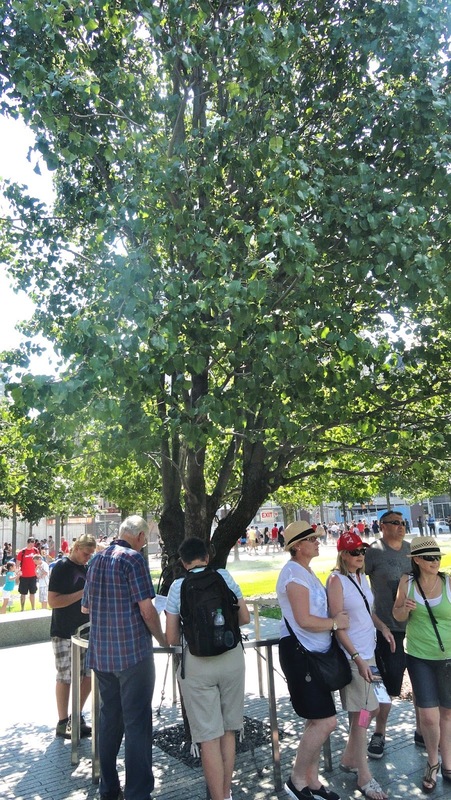 The Survivor Tree, a Callery pear that was found at Ground Zero severely damaged but still alive, had been returned two years earlier and was thriving. It had been mended and cared for then given grafts of young branches and replanted among the new trees, a symbol of resilience and rebirth. Look for a taller, darker green tree encircled by a low metal fence with an identifying plaque. Pass an 80-foot-high steel column trident, on the way in. Photo © by Judy Wells. Enter the museum through a glass building on the ground level, and pass through security screening. Proceed down an escalator beside one of the trident columns from the facade of the North tower. The museum is an underground architectural wonder. 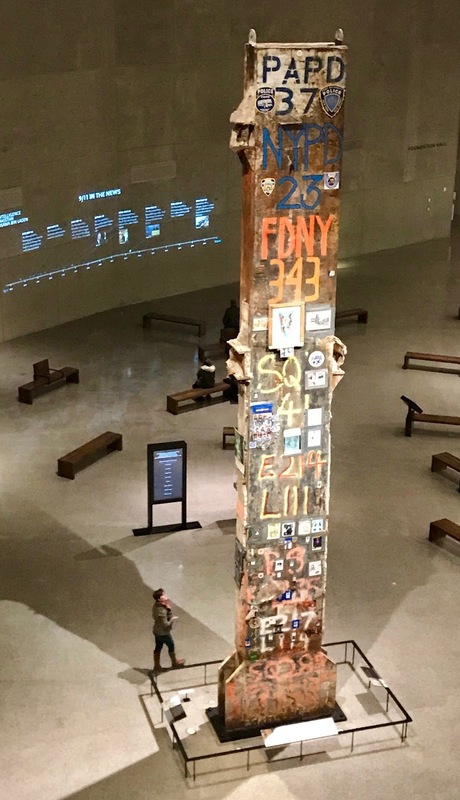 It includes three exhibition sections telling the story of what happened: the day of 9/11, before 9/11 and after 9/11. The memorial exhibition area commemorates the lives of those who perished. 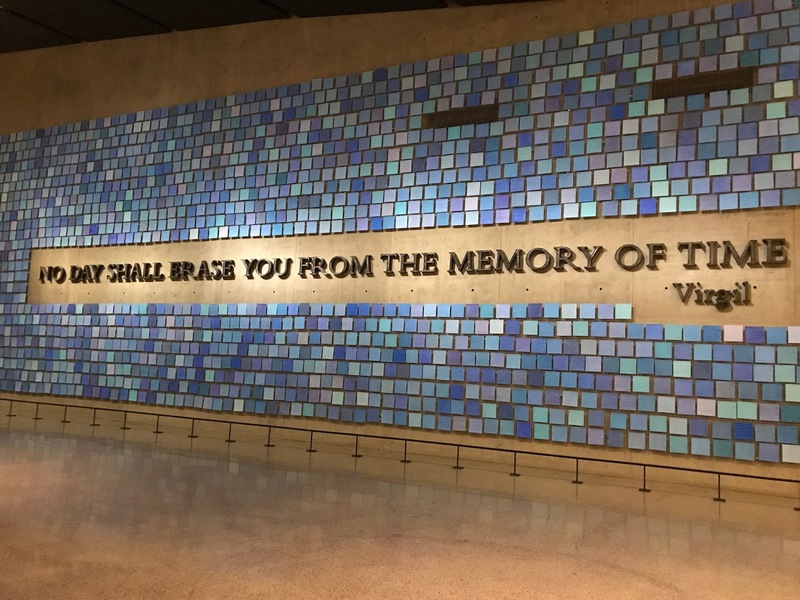 A large room contains floor to ceiling photos, one for each victim, bringing a deeper and more personal impact. You can type a name at a console to see more information provided by the victim’s family. At the center of this room is a smaller room lined with benches and a transparent glass floor with the original ground beneath. The eerie room is kept dark, and the names of the victims are read aloud one by one and projected onto the wall. This brought tears to my eyes and a giant logjam in my throat. To see those faces, young and not so young, smiling, full of life and promise that in moments were gone…. Yes, it is a miracle that so many did manage to escape those two buildings but that is of little solace to the loved ones of those who didn’t. 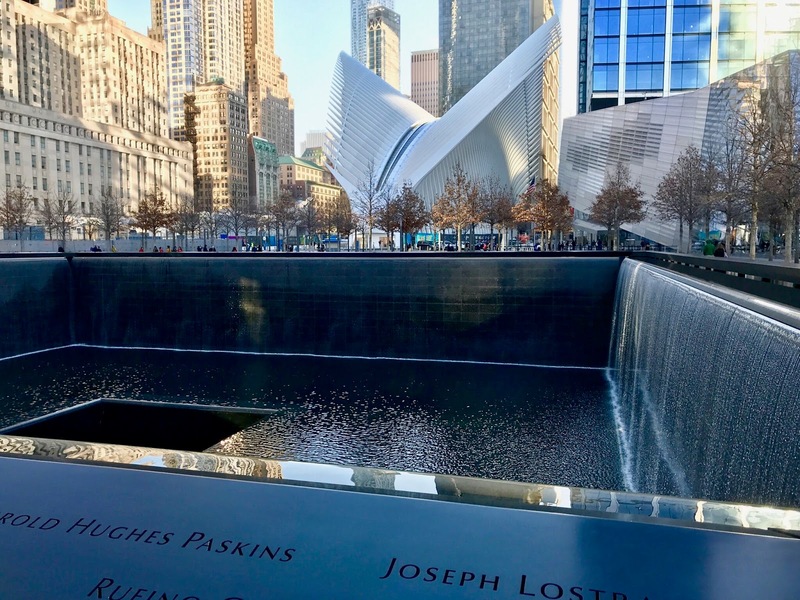 I went into a theater to see Rebirth at Ground Zero, a multi-screen film experience that uses the time-lapse footage to present the transformation and renewal of the World Trade Center site. I found the beginning of this film painful to watch, seeing some the flag-draped coffins removed from Ground Zero with the quiet and respectful reverence paid by the workers. Before and after the film I toured examples of how artists had responded. Trying to Remember the Color of the Sky That September Morning by Spencer Finch. 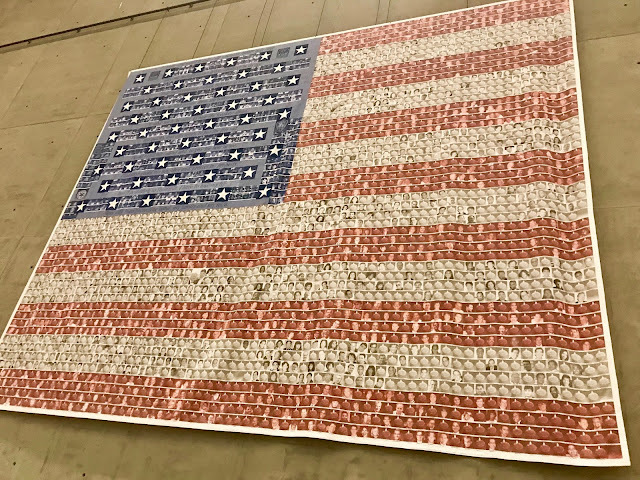 Everyone remembering 9/11 speaks of the brilliant blue sky that morning and artist Spencer Finch created 2,983 watercolor squares, each a different shade of blue and each commemorating victims of Sept. 11, 2001 and Feb. 26, 1993. No Day … Like an exclamation point across Finch’s sky squares is a quote from the Roman poet, Virgil. The words “No Day Shall Erase You from the Memory of Time, taken from Book IX of the Aeneid, were forged from pieces of recovered World Trade Center steel by New Mexico blacksmith Tom Joyce. Memorial Urn. 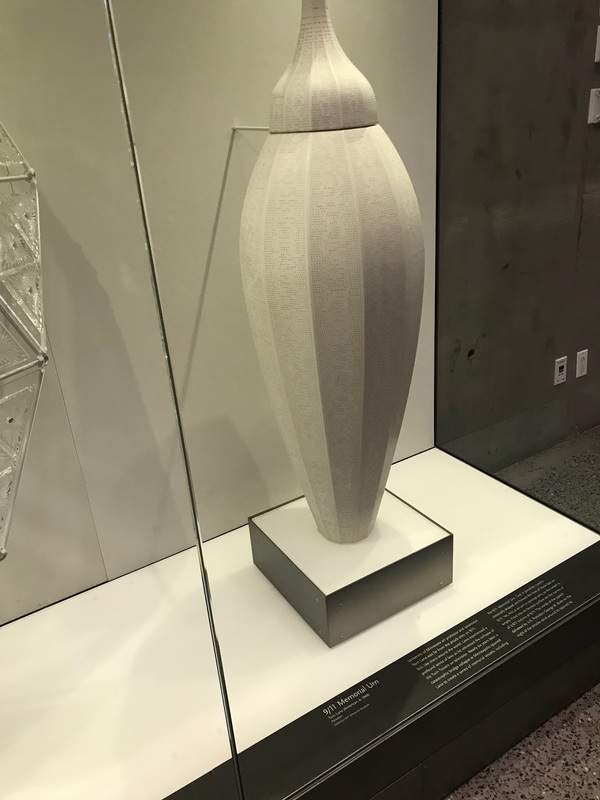 This is one of a series of porcelain memorial urns created by ceramist Tom Lane. 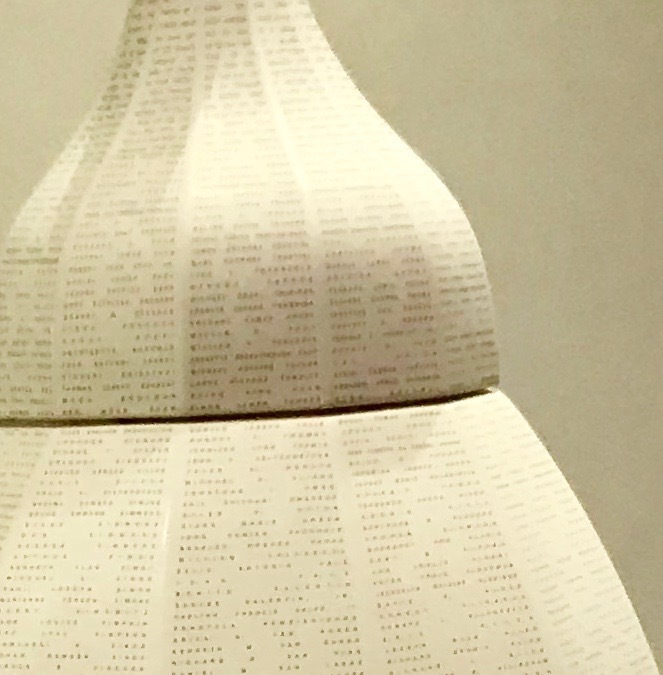 Instead of ashes inside, fired into the urn’s surface are the names of the 2,977 victims of 9/11. Cover Stories. Thirty-three The New Yorker magazine covers track the influence on the city of the twin towers and of their loss. Lady Liberty. 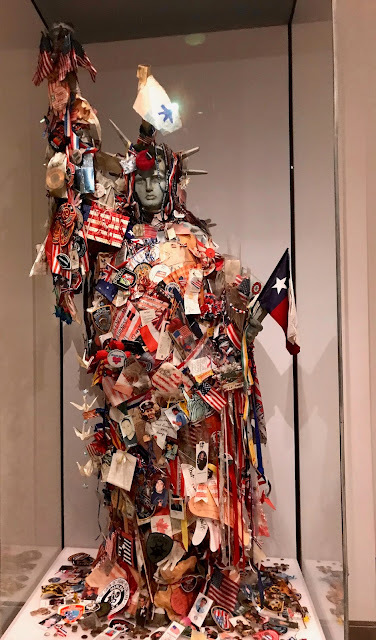 Since the beginning, this fiberglass image of the Statue of Liberty has been covered with an ever-growing collection of tributes from flags and condolence messages to prayer cards, rosary beads, money, military patches and insignia. Nearby is a smaller version where messages from children who participate in the Museum’s activity center are pasted. 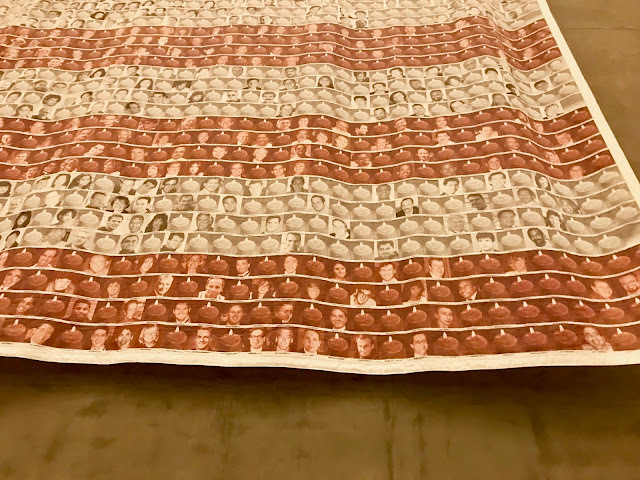 Flag of Remembrance is made up of faces and names of 9/11 victims with photographs of uniformed first responders forming the blue field and stripes of red and white composed of photographs of civilians. 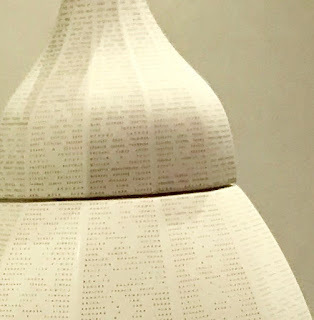 It was conceived by Mindy Kombert and Sherry Kronenfeld in the immediate aftermath of 9/11. After obtaining the photographs and transferring them to fabric, they spent three years sewing on the individual squares of cloth. First responders are in the blue field between words of the Firefighter’s Prayer, civilians are inside red and white stripes. The memorial candles are for roughly half of the victims whose images were not available at the time. As poignant as the man-made tributes and expressions are the recovered remnants. 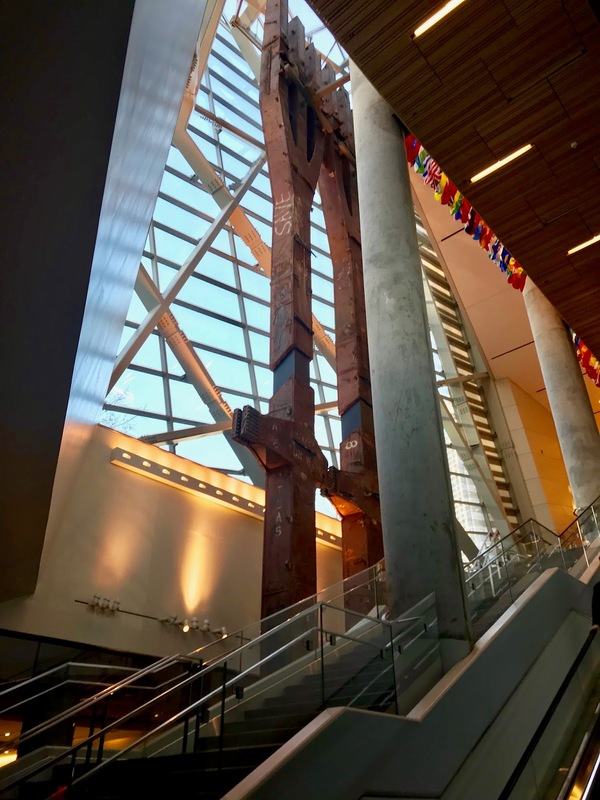 Like a Nike of tragedy, this steel fragment from the façade of the North Tower reflects the impact of Flight 11 as it struck the building. Similarly, is the “Last Column” that became the symbol of loss and recovery. From members of FDNY Squad 41 who first marked it in memory of their colleagues who died nearby to the millions who watched as it was covered in black and draped with the American flag for a hero’s exit as it was solemnly trucked out, this 58-tons of welded plate steel evoked the city’s resilience. Also, the May 28, 2002 end of recovery at Ground Zero. As I left this area, I moved past what is called the Survivor’s Staircase. 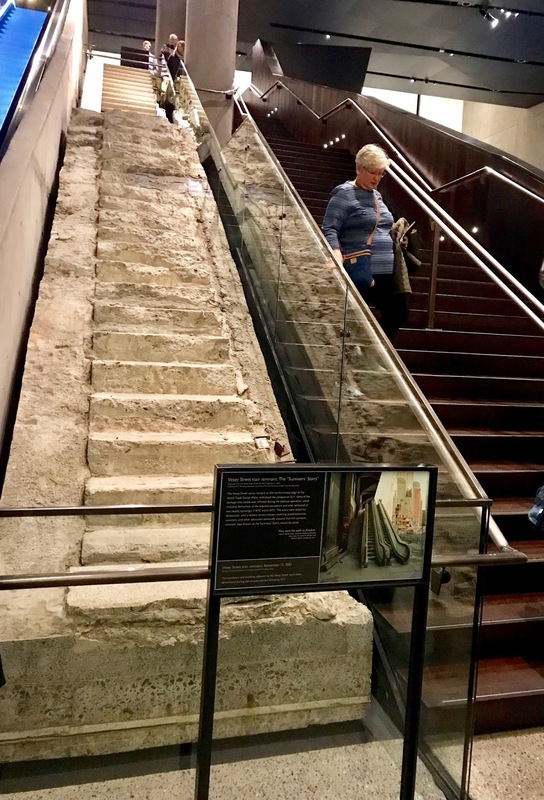 This concrete stairway used to sit outside and became a lifesaver for thousands who exited the building before it collapsed. 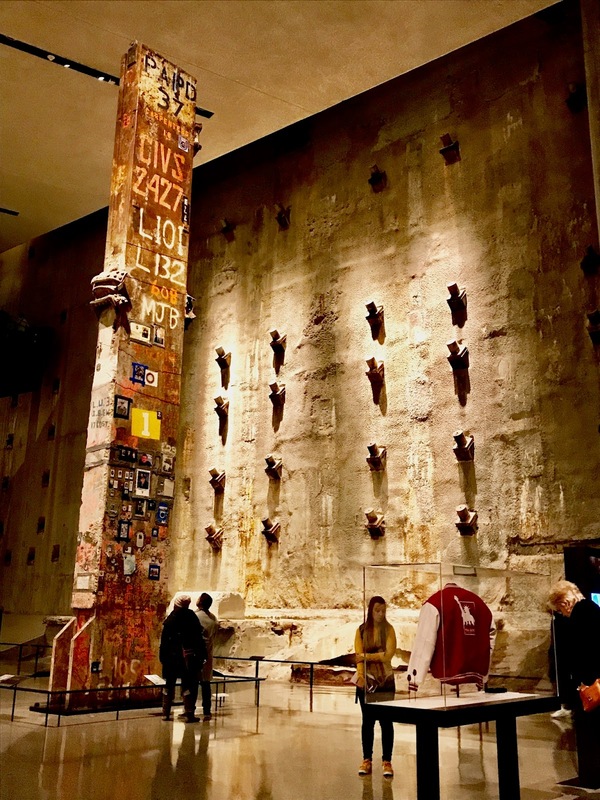 The second room is an extended timeline of September 11. A warning sign hangs outside of the room as the videos, and rescued mementos inside are very poignant and graphic. I found some of the live footage and answering-machine messages disturbing, but I’m sure the families must have given permission. There are many barely recognizable, dust-coated fragments of office items, artwork, and personal possessions. I second Debi’s reaction and was particularly affected by a battered, dirty seatbelt from one doomed flight and the children’s clothes from the plane that crashed into the Pentagon. Perhaps because I had been so focused on those at ground level, I hadn’t give thought yet to those who died inside what became weapons of mass destruction. Among the items stored on the premises, though not open to tourists, are the unidentifiable remains of 9/11 dead, human residue for which no other resting place has been found. So, this museum is also a graveyard. The museum shop seemed out of place although I do suspect some people want to buy the books about the event. Sweatshirts? No. The 9/11 Museum is not without controversy, but these historically significant items must remain somewhere. 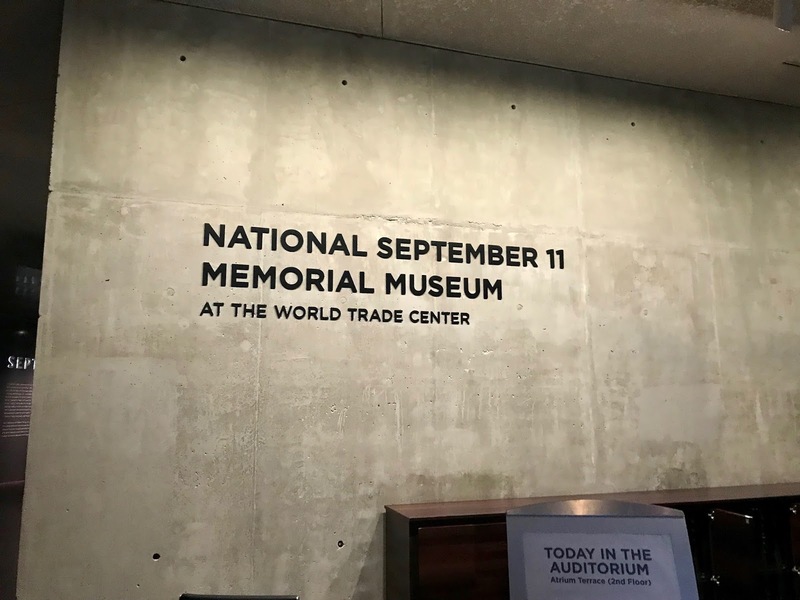 In the coming years, I think the exhibits will help others understand what happened on that tragic, but important day in American history. 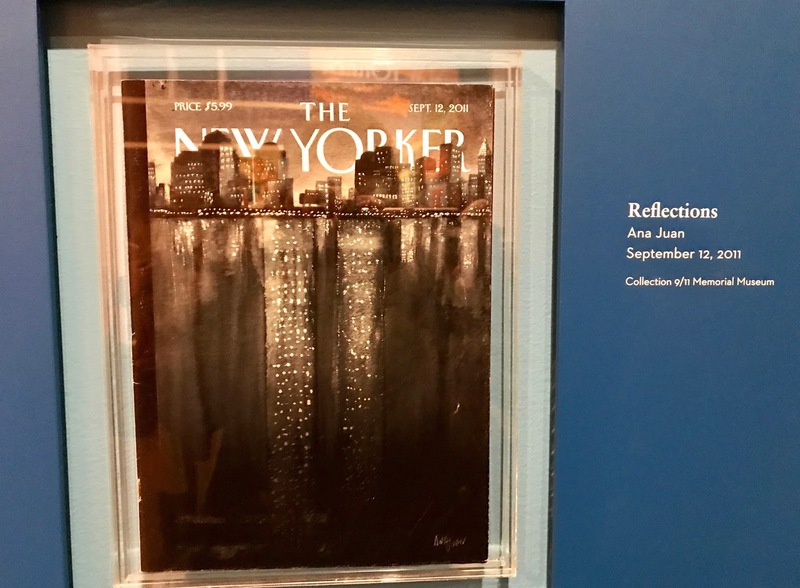 If you go: The cost for adults is $24, but I used a CityPASS, a package that saves money if you are touring other sites in NYC. The audio narrated by Robert DeNiro was an additional $7 and well worth it. Guided group tours and an app are also available.